Move Outlook Express folders to Outlook in batch mode with DBX to PST Converter. Excellent software utility solutions from the most asked for in download directories! Browse the featured software package groups, check the most recent releases of the amazing softwares, and download right away! Do not lose chance to setup the first class package: employ SoftEmpire directory to setup tools for free. Check out the library of shareware and software package trials. Search among operating system utilities programs, recieve manipulators, antiviruses, and all other kinds of software for your PC or digital phones! Web Stream Recorder 2010 is a new, improved version of a popular program for saving multimedia data streams from the Internet or LAN to PC. This recorder can record music, video, radio broadcasts, allowing you to watch offline any multimedia stream, including online radio, TV, YouTube, GoogleVideo, WinAmp, etc. 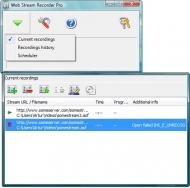 Web Stream Recorder 2010 can save Windows Media Audio/Video streams (ASF, WMA, WMV, WMX, NSC, WAX), Real Media Audio/Video streams (RM, RA) and Shoutcast streams (files with the MP3 extension). Web Stream Recorder 2010 automatically intercepts multimedia streams while you are surfing the Internet and starts recording. You can restart, delete or replay media streams when you want. What is important, the program supports multiple simultaneous downloads. It is also possible to watch the streams' recording status. When you start the new record, the program shows additional information on the recording like the URL of the recorded stream, the size of the record, time and status. Web Stream Recorder 2010 has a number of additional functions, like a handy and effective task scheduler, ASF (Windows Media) streams auto indexing, recording FLV (Flash video) streams and YouTube video clips. Web Stream Recorder 2010 prevents the loss of video stream quality because it saves web streams in their original quality, as they come from the Internet, - no loss of quality as it happens when you capture video from the screen. Web Stream Recorder 2010 is extremely easy in use thanks to the "minimum operations, maximum benefits" approach and a compact, modern-looking interface. Its stylish, distinctive panel buttons make the program a real pleasure to work with. The program features multilingual interface. Web Stream Recorder 2010 requires Windows Media player 9.0 and is available for Windows 2000/XP/Vista/Win7 - 32/64 bits. WorkoutGenerator is a simple tool to create a random workout based on used inputted information. It will also keep logs of your progress. Aerobic workouts included! WorkoutGenerator is 100% free to use and keep. Go to http://www.WorkoutGenerator.com. iNetGet is a download utility that gives you convenience and flexibility in downloading on the Internet.A key feature of iNetGet is its ability to resume broken downloads, after checking date and size. It can also sniff and play youtbe video.